My father, as I have stated, was "a painter and gilder." He worked at Davenport's. A new manager there introduced new methods of conducting the business. For one thing he introduced female labour in a department which had hitherto belonged almost exclusively to the men. This new competition was resisted, partly as an innovation and partly because of the serious reduction in wages it involved. The men resented and resisted the change. They struck work with the winter before them, and with no organisation on which to depend for assistance. They had no resources whatever. Like too many strikes in those days, it was based on their resentment, with no means to sustain the strikers during the struggle. The sense of injustice made the strikers brave, self-sacrificing, and they were heroic in many senses, but heroism is a poor substitute for organisation, with the sinews of war laid by for the time of need. This has been a later discovery of trade-unionism, and is now carried out with a clear-headed statesmanship which rivals any political or commercial management in the country. This later organised trade-unionism has become a force which governments as well as employers have to reckon with. It can speak in the gate with an enemy, or it can enter a council chamber with the full consciousness that it represents both power and knowledge. This is all very different, and beneficently so, from the wild and frantic struggles of starving men. I suppose my father must have been a sort of ringleader in this strike, for many years after I saw a letter from his brother-in-law, who was one of the managers of the works, to say that, if he did not give up his support of the strike, Mr D. had told him he would ruin him, and force him and his family into the workhouse. This bitter prophecy became bitterly true. Such intimidation in those days could be easily carried out by employers. They had means, too, of circumventing a man industrially; and he could be run down by their sleepless vengeance like a rat. It appeared that my father would not be "intimidated," nor would he desist in his effort to maintain the strike. So we were indeed driven into the workhouse. I have sometimes wondered whether a direct Nemesis was sent to balance this sorry, reckless piece of vengeance. It would be easy to unfold a harrowing tale of what followed this man's wild revenge in his family history. In this matter, to attempt to trace cause and effect would be inexpressible presumption, but, at the same time, coincidences arrest attention. I can well remember seeing one piece of furniture after another disappearing from our home. This explains why we had no clock to consult when poor Bill S. called for me and took me off to work between twelve and one o'clock. I can remember, too, how on bitter winter days I went to work with Old Rupert without food, and how the old man supplied me out of his little store. I can remember many Saturday nights coming home when there was not a morsel of food in the house, and the next day Sunday, and all the shops to be shut up. One particular Saturday night, when the younger ones were crying for food, and hardly any fire in the grate, there came a knock at the door, and a young potter came in. He knew our family well, and though not related directly, he was so indirectly. He carried signs of being better off than most working potters, as he was, for he had some private means besides his weekly earnings. He was dressed in black, with the usual potter's white apron rolled round his body, just over his waistcoat pockets. It was usual to wear a white apron in those days, even during holidays, and I have heard of a young fellow, between eighty and ninety years ago, who was sent out as a Methodist preacher on trial, who went to his circuit with his white potter's apron rolled round his waistcoat. What makes me remember so vividly the position of this particular apron, was that after this young visitor had been in the house a short time, and had heard the story of our need, I saw him put his thumb and finger down between his apron and his waistcoat. When he brought them back I saw a silvery gleam between his finger and thumb, and in a very few minutes I saw bread and butter on our table. I always connected the apron with that change on our table, and the feast which followed. This young potter I gratefully remember, too, for another reason. His name was William Leigh. He was then, as in his after life, of studious habits, modest, and upright in all his ways, and whose life had much fragrance and sweetness in it. He found out, from seeing me reading at nights when he came to our house, that I was fond of reading, and up to the time of going to the workhouse he regularly supplied me with books, and these were as precious as the bread he gave us. It was he who first opened to me the great world of literature, and from that day I have known "the world of books is still the world." My actual world was bare enough and narrow enough, but in the world of books I had "ample verge and room," could commune with those "who rule our spirits," and hold my mean environment in some disdain when compared with the wealth and imagination poured at my feet. But to come back to the impression of that white apron. For years after I always looked with a curious interest on a white apron when rolled round the body, and had a sort of undefined feeling that there was a sort of magic lying within its folds. It was some years before I distinctly realised that there was a waistcoat pocket hidden by the apron, and that in those days men generally carried their money in their waistcoat pockets. How that winter was got through God only knows. We were not the only sufferers. In that year, 1842, distress was general and deeply bitter. 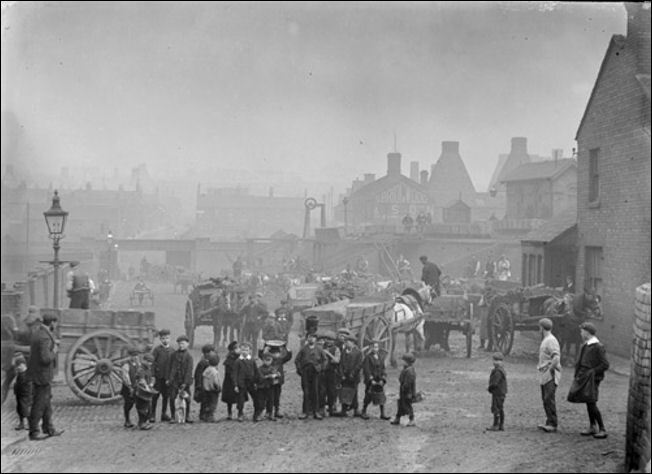 "Children wait patiently to pick up small lumps of coal dropped by the coal merchants. Once bought by a merchant then dropped in transit the coal became fair game. Children would hurry the coal home for use on the fire. Domestically, coal was used for heat, to cook and to heat water." Mr Walpole, in his history, says that England touched in that year the lowest point in its condition. I saw it proved in that year by daily and powerful illustrations that "if it were not for the poor the poorer would perish." Semi-starvation was the normal condition of thousands, pinched faces and shivering bodies were seen everywhere during that cruel winter, carts were followed for miles for any coal they might lose on their journeys, and a jolt was a godsend to the eager follower at the cart tail. The glistening lumps as they fell made eyes glisten, as it meant fire in the black shining treasure. Shord-rucks were searched by shivering women and children for cinders, as hens scratch and search for food. Fingers bled as they picked in among the broken pitchers and shords, and the bleeding was only staunched by dirt and frost. Those who got a miserable pittance of out-door relief got bread which might have been made of sawdust, blotched with lumps of plaster of Paris. It is a pity one of those loaves could not have been preserved for inspection and comparison in these later days. Those were the good old days when the Corn Laws made rent high and living low, and made semi-famine the ordinary condition of the country for the toiling masses. Toil, however, grinding as it was, was rendered fitful and uncertain by that ubiquitous Protection, which protected nothing but the wealth of the landlords, and really not even that. The home in which I lived was getting less homelike every week. Everything which could be turned to money or goods had to go. I remember two beautiful tiles which had been painted, so I was told, years before by a friend of my father's, a skilful flower-painter. Many a time did I look at those beautiful flowers on the tiles as they stood on the mantelpiece. They were china tiles, with a rich shining white glaze. They had fruit and flowers painted on them, and one of the roses charmed me then in sight, and has charmed me more than sixty years in thought. Especially when I see lovely roses do I think of that rose on the tile. I have never seen one quite so lovely as that which shone forth amid my early sorrows. One morning, however, in that winter time, I remember, as we were shoeless and clogless, I was sent with those tiles to a dogger to ask if he would give two pairs of clogs to two barefooted boys for those tiles. The dogger looked in wonder and pity upon the little applicants. It was plain, even to me, that he had no hesitation to make the bargain on the ground of value. He went out of the shop, however, to consult someone, and returned without the tiles, and put us the clogs on our feet. So went on the rack of home until ruin came, and all had to go. Thus far my father's employer's prophecy had come true. No one would employ him, and so the other part of the prophecy hastened on to its fulfilment. 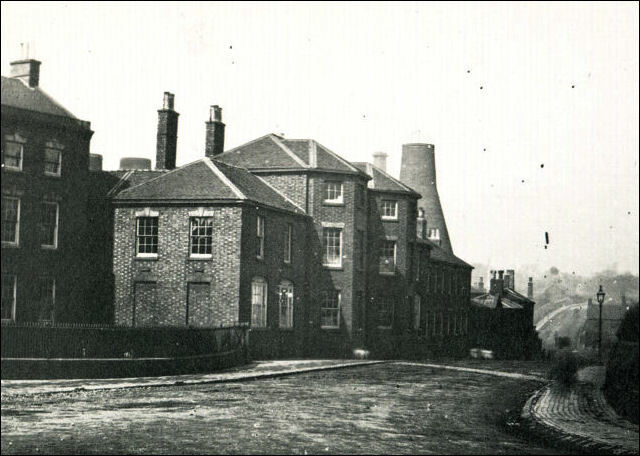 This accounts for the incident I have referred to before, that one morning, instead of going to the works to join Old Rupert, I was taken to Chell Workhouse. Early in the morning we left a home without a morsel of food. We called on a relative who had kindly provided breakfast for us, and yet it was a wretched meal for my parents. I remember the choking sobs, though I did not understand them as I did afterwards. I remember, too, how the food seemed to choke as much as the sobs, and the vain entreaties to "eat a little more." We went by the field road to Chell, so as to escape as much observation as possible. One child had to be carried as she was too young to walk. The morning was dull and cheerless. I had been through those fields in sunshine, and when the singing of birds made the whole scene very pleasant. Now, when the silence was broken, it was only by deep agonising sobs. 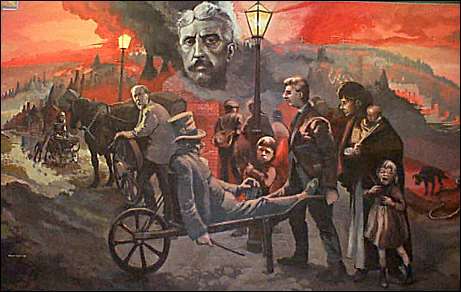 If we could have seen what was driving us so reluctantly up that hill to the workhouse ("Bastile," as it was bitterly called then), we should have seen two stern and terrible figures— Tyranny and Starvation. No other powers could have so relentlessly hounded us along. None of us wanted to go, but we must go, and so we came to our big home for the time. The very vastness of it chilled us. Our reception was more chilling still. Everybody we saw and spoke to looked metallic, as if worked from within by a hidden machinery. Their voices were metallic, and sounded harsh and imperative. The younger ones huddled more closely to their parents, as if from fear of these stern officials. Doors were unlocked by keys belonging to bunches, and the sound of keys and locks and bars, and doors banging, froze the blood within us. It was all so unusual and strange, and so unhomelike. We finally landed in a cellar, clean and bare, and as grim as I have since seen in prison cells. We were told this was the place where we should have to be washed and put on our workhouse attire. Nobody asked us if we were tired, or if we had had any breakfast. We might have committed some unnameable crime, or carried some dreaded infection. "No softening gleam" fell upon us from any quarter. We were a part of Malthus's "superfluous population," and our existence only tended to increase the poverty from which we suffered. "Benevolence," he said, "in a being so shortsighted as man, would lead to the grossest error, and soon transform the fair and cultivated soil of civilised society into a dreary scene of want and confusion." This truly was "a nice derangement of epitaphs" to come from the pen of a clergyman in a Christian country. I have wondered if the pen with which he wrote was "a steel" pen. In this spirit Carlyle's "Poor Law Bastiles" were not made "pleasant places." The place was as innocent-looking as to hospitality as if it had been built in a flinty rock, and never had a human being in it. We youngsters were roughly disrobed, roughly and coldly washed, and roughly attired in rough clothes, our under garments being all covered up by a rough linen pinaforte. Then we parted amid bitter cries, the young ones being taken one way and the parents (separated too) taken as well to different regions in that merciful establishment which the statesmanship of England had provided for those who were driven there by its gross selfishness and unspeakable crassness. Talleyrand has said that it was astonishing what pleasant lives the French noblemen lived before the Revolution. It may be said equally, that many well-to-do people lived pleasant lives in England before the Corn Laws were repealed, while little children, through long hours of labour and scant food, were passing through a very Tophet of agony, and their cries were only heard by such folks as Mrs Barrett Browning, Carlyle, and Lord Ashley. And even " Young England " to-day, among the working classes, hears not nor heeds the ground surges of the first half of the last century.